Non-profits all over the world are taking advantage of AppSheet's simple and inexpensive app deployment model to create mobile apps that tremendously simplify their daily work. Lingga Darmawan is HITA (Hotel Information Technology Association) Indonesia's Vice Chairman, and he was recently tasked with creating a vendor database for the organization. HITA Indonesia is a non-profit community of more than 500 IT professionals who work in the hotel and hospitality industry. The group is a venue members come to exchange ideas about technology that affect their work and help each other with IT issues they face daily. Previously HITA's registration method was via Google Forms-- but the restrictions of using Google Forms alone meant there was no actual directory all members could use to view and communicate with each other. 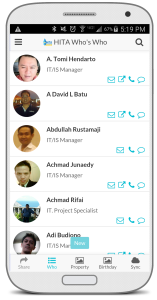 Lingga was simply sharing the backend spreadsheet with all members, which was complicated and difficult for users to easily view on a mobile device. Lingga used AppSheet's Google Forms add-on to create an app from his form, and he was immediately surprised at the functionality AppSheet unlocked in the mobile version of his forms. His app not only allows for simplified search of the 500-contact database, but also enables members to call, text, and email each other straight from the app. It has simplified the registration process, enabling members to search registrants as they are added into the system. "It is a really great product to simplify our daily tasks. And AppSheet is capable to do more complex [functions] than Google Forms," says Lingga.